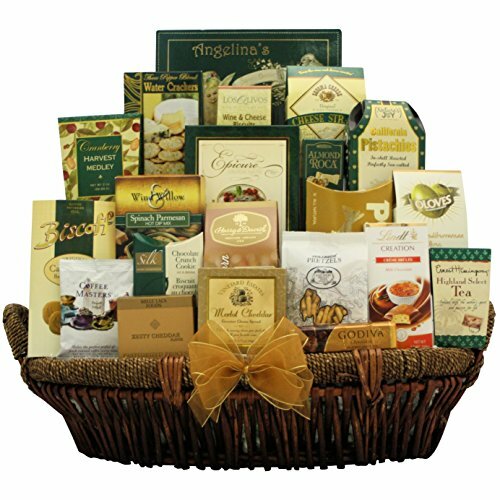 Our 'Holiday Gallant Affair' Gourmet Gift Basket is sure to stand out as one of their favorites this holiday. Featuring upscale gourmet foods such as Smoked Salmon, Olives Tasty Mediterranean Olives, Lindt Milk Chocolate Creation Crème Brule Bar, Godiva Milk Chocolate Crocoite Bar, Biscoff European Caramelized Belgian Cookies, Harry & David Caramel, Cashew & Almond Moose Munch, Coffee Masters Vanilla Nut Crème Coffee and much, much more! A wonderful choice that they can enjoy throughout the entire holiday season. Our 'Holiday Gallant Affair' Gourmet Gift Basket is sure to stand out as one of their favorites this holiday. Features Smoked Salmon, Olives Tasty Mediterranean Olives, Lindt Milk Chocolate Creation Crème Brulee Bar, Biscoff European Caramelized Belgian Cookies, Harry & David Caramel, Cashew & Almond Moose Munch, Coffee Masters Vanilla Nut Crème Coffee and more! A wonderful choice that they can enjoy throughout the entire holiday season.